Quán Ăn Ngon @Hoan Kiem (Ha Noi, Vietnam) | Get Your Grub On! Mediocre start with a nice safe. It was my first night in Hanoi and waiting for my brother to arrive later that night a friend and I went to get some grub at ‘Quan An Ngon’ around the corner from our hotel. The setup looked promising with a nice outside garden filled with tables and different stalls offering all sorts of Vietnamese favourites. 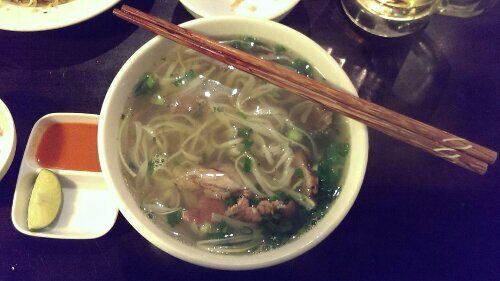 As a must start of every Vietnam trip and because it was rather chilly outside I started with a bowl of hot ‘Pho Bo‘. Unfortunately this turned out to be rather boring, even though the soup was warm and comforting it lacked that special taste and was not really different to any sort of ordinary chicken soup; no cinnamon and besides lime and chilli sauce no condiments to add. The noodles were pretty soft too and only the beef slices were nicely lean, soft and tasted kina nice. Not my greatest find but I had already heard that pho in the north is very different and less unique compared to the type you get down south. Not fully satisfied I tried to turn things around by ordering ‘Bánh Xèo‘, the Vietnamese street style pancake I knew from HCMC and the street food festival in Singapore. 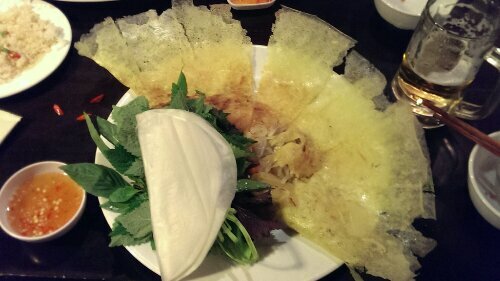 When it came I was quite happy to see lots of greens on the plate as well as some rice paper to wrap it all up in. I knew this only as lettuce wraps but couldn’t wait to give it a try anyway. It turned out to be quite good, the crispy pancake, the basil and mint and the crunchy sprouts all worked quite well together and were fun to eat too. Overall this was a tad dry and nothing I would really call a taste explosion but still quite satisfactory and actually managed to reconcile me over the letdown with the pho. This place is probably a good start for visitors to try out many different Vietnamese delights and phase into the local cuisine at an obvious clean place with friendly English speaking staff and a nice beer garden atmosphere. There are many other dishes to try here so I might come back and give them another shot when I’m in Ha Noi the next time around.